Hillary Clinton and Bernie Sanders faced off once again on CNN for a post Super Saturday debate. The debate took place in Flint, Michigan where the area is facing a big scandal due to water pollution. Both candidate called on the governor of the state to resign. They then got into heated exchanges over jobs, trade agreements and Wall Street. 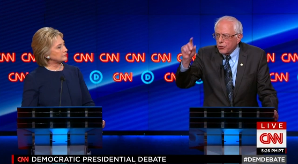 At one point, Bernie Sanders yelled at Clinton to stop interrupting that the is speaking. Sanders tried to make a pitch to minority voters by mentioning his years as a student at the University of Chicago. Clinton spoke of her time working for Marian Wright Edelman where she investigated Alabama schools for discrimination based on race. Both candidate voiced this differences on fracking with Clinton in support of it and Sanders against it. With Clinton taking in a large amount of delegates, Sanders is now on the defensive and is trying all he can to get votes in order to be viable in this election.